Opening weekend: What have we learnt? | Football: The Beautiful Game. Football: The Beautiful Game. My views/thoughts on the greatest game in the world. Home › Football › Opening weekend: What have we learnt? Opening weekend: What have we learnt? After a long summer away, the opening weekend of Premier League fixtures has been complete but what can be learnt from round 1 of the season? Well the ‘big 3’ look strong. Manchester United, Manchester City and Chelsea all looked strong in victory. All played sensational football at times. Champions Man Utd have had much doubt placed over them and new manager David Moyes over the summer but made a giant step towards proving the doubters wrong. Moyes will be excited at the connection between Welbeck, Van Persie and when he came on, Rooney. United’s 3rd and 4th goals in their 4-1 win away at Swansea were world class. On Sunday, Chelsea played their first game of the second coming of Jose Mourinho. In the first half the blew Hull away, scoring two quick goals which could have been more if Lampard wouldn’t have missed an early penalty. They effectively settled for the win in the second half, with the score ending 2-0 but it was clearly evident that Chelsea had a few more gears to find if they needed them. Monday night saw City demolish Newcastle 4-0 at the Etihad. At times the front trio of Aguero, Dzeko and Silva were unplayable, back to the best of their title winning season. With new signing Fernandinho partnering Yaya Toure in central midfield they looked in total control and were unlucky not to win by a bigger margin. Newcastle in all honestly look hapless and their night was summed up when Steven Taylor was sent off for clattering Sergio Aguero round the back of the head. They also need a number of signings before the end of the window or relegation could be a serious threat. There were also wins for Spurs, away at Crystal Palace, and Liverpool, who beat Stoke in the early kick off, both by 1-0. Both will be happy with their starts but know they will have to improve. Stoke could have so easily grabbed a point having missed a late penalty and Spurs had to endure a nervy final few minutes as Roberto Soldado’s penalty was the only time they were able to find the net. What has been learnt is that Arsenal need new signings, and soon. The Gunners lost 3-1 at home to Aston Villa with a lackluster performance. The anger amongst the fans was clear to see. it is clear that Arsenal need to bring 3 or 4 through the Emirates door before the end of the transfer window or they face missing out on the Champions League which would be a disaster. On the other side of the coin, Villa played incredibly well. The front trio of Benteke, Agbonglahor and Weimann played phenomenally and can cause all sorts of all problems to any defenders in the league. Villa could have a much better season than last time out. At the other end of the table, all three newly promoted sides lost their first games of the season but not much should be read into this as in reality they all had tough fixtures. 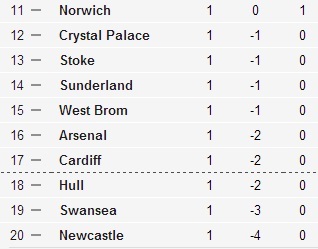 As mentioned, Palace lost at home to Spurs, which is no disaster. Yes Spurs dominated the game but Palace kept the score to 1 and could have snatched an equaliser late on. A lot more will be learnt as Palace go away to Stoke next weekend. Hull showed enough in the second half of the game away to Chelsea that they will give a good account of themselves this season. They looked particularly comfortable when they brought the experienced Tom Huddlestone and Jake Livermore on. Again, we will learn a lot more about Hull in their next fixture as they entertain Norwich in the first home game back in the Premier League. 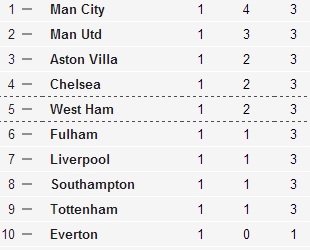 Cardiff lost 2-0 away at West Ham on their return to the top flight, again another tough match. It may take more time for the new major signings to gel having only recently signed the likes of Gary Medel and Steven Caulker. We perhaps learnt that Cardiff might struggle for goals, although new signing Andreas Corlenius didn’t feature and Cardiff fans will hope for him to be their main provider of goals this term. Elsewhere there were wins for Fulham, who won away at Sunderland thanks to a goal from Pajtim Kasami, Southampton, who grabbed a late winner away at West Brom courtesy of a Rickie Lambert penalty whilst Norwich and Everton played out a 2-2 draw at Carrow Road a game in which young Everton midfielder Ross Barkley impressed and Ricky van Wolfswinkel scored a debut goal. © 2019 Football: The Beautiful Game.